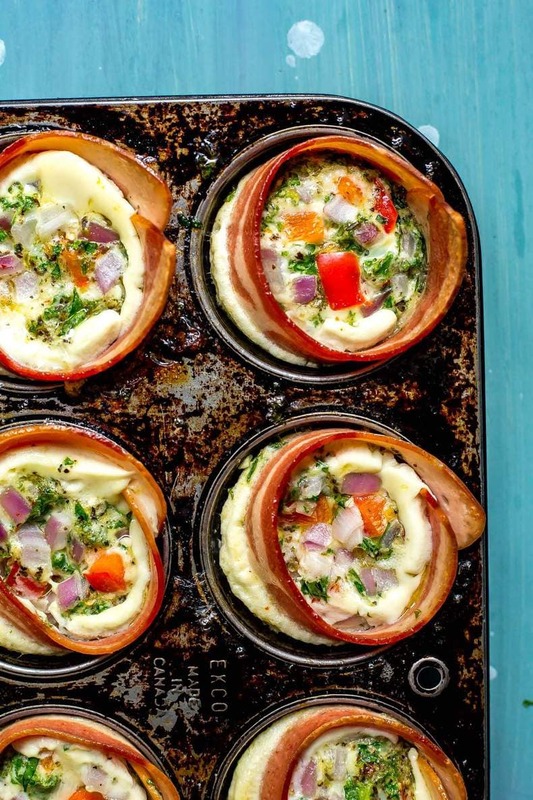 These Grab & Go Turkey Bacon Egg White Cups are a delicious grab and go breakfast idea filled with veggies – and they're ready in just 25 minutes! 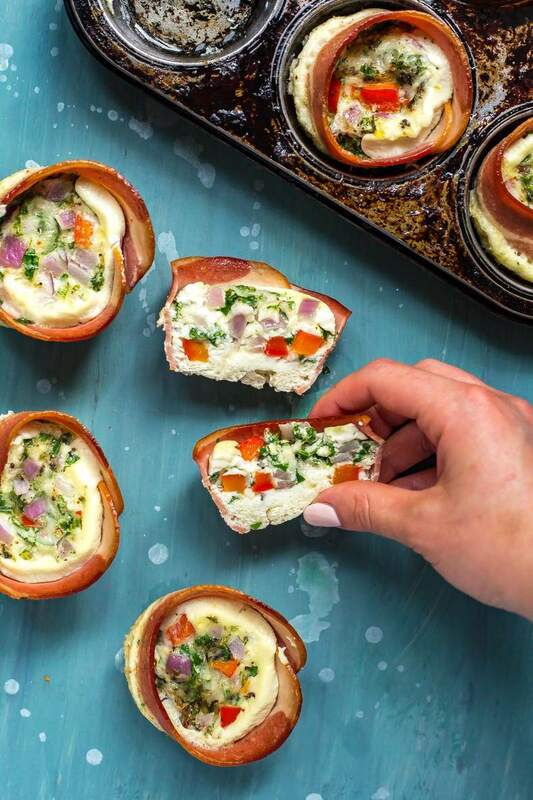 Say hello to the easiest, most delicious breakfast idea ever – meal prep ready for the week in 30 minutes or less to be exact. Breakfast is the bane of my existence. Literally. I hate most breakfast foods, but that may just be because it takes me forever to gain an appetite in the morning. Don't get me wrong, I can be an early riser. I love the peace and calm of mornings when you're awake before anyone else and the world just seems to stop. I love getting up early for that exact reason, the quiet. No emails are being sent out yet, and I'm at my most productive without any distractions. But I also take a long time to fully wake up. Like, as much as I love working out, I won't be that person you find jogging outside at 8am on a Saturday. And I must admit that since I started working from home, I stay in bed much longer than I did when I had school and other jobs. It takes me a while to get going. And my stomach is the same. Regardless, I know I *should* probably, maybe eat a wholesome breakfast. I'm all about nourishing myself and optimizing my energy these days. So, that's where these Grab & Go Turkey Bacon Egg White Cups come in handy. One minute in the microwave and you've got a hot breakfast that's super low in calories but high in protein and you even sneak some veggies in your first meal of the day. Rushing to work or just lazy like me? These egg white cups have GOT you. And did I mention they're freezer-friendly too? You can make several batches of these at a time and freeze for week's worth of on-the-go breakfasts at a time. And if you get sick of the same old veggie and cheese combo you can switch it up too. 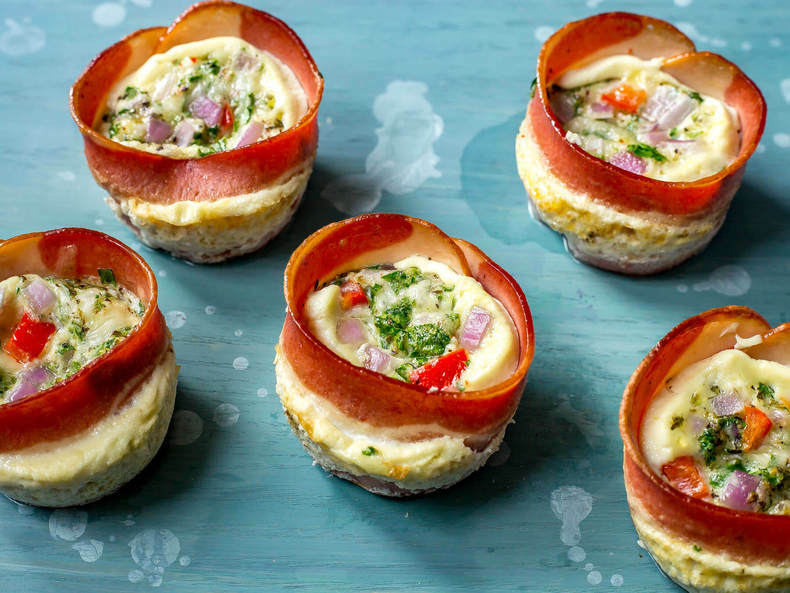 I made a broccoli cheddar version of these egg white cups the other day that I think I liked even better than these ones. I've also recently made a caprese version with mushrooms, basil and cherry tomatoes. I think I have a slight obsession with egg white cups, or freezer-friendly breakfast ideas in general like these Tex Mex Breakfast Quesadillas or these Mini Breakfast Pizzas. To die for – bye-bye boring old breakfasts! Also, I included egg whites here to keep the calorie count down and the protein count high. I like using the free run egg whites from the carton because they're so much easier to prepare and really cut down on the time you need to spend on this recipe. There are two egg whites per egg cup, and I usually eat two of these for breakfast so you're getting 4 egg whites and almost 30g of protein per serving for this recipe. You can TOTALLY use normal eggs here though too, but you would only need 12 eggs all whisked together as opposed to 24 egg whites (which works out to be a little more than a half of one 500g carton of egg whites). So, customize these babies as you'd like. It's funny how customizable these are because I actually meant to use spinach in these egg white cups and realized after the fact that I forgot to pick some up for this recipe at the store when I did my weekly grocery haul. I did, however, have some kale on hand that I had used for another recipe so in it went in place of the spinach. Still tasted just as good – I highly recommend using any greens you have on hand for this. 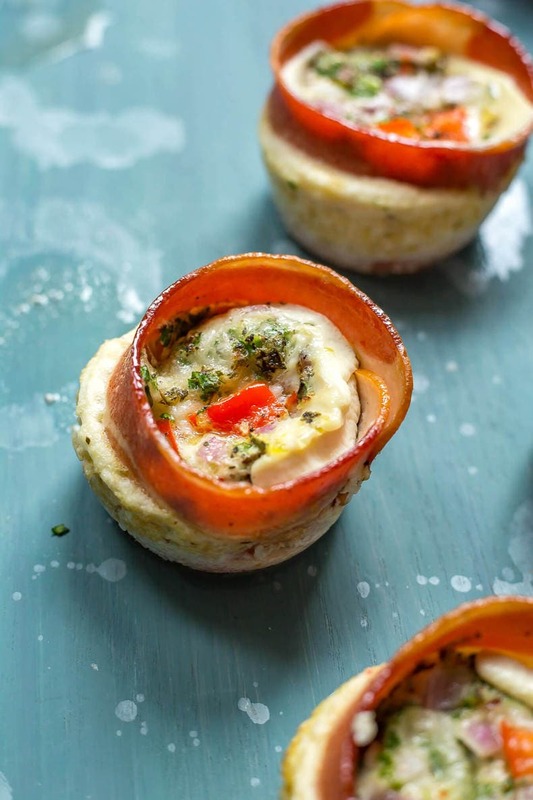 Will you be making these Grab & Go Turkey Bacon Egg White Cups? When meal prep is this easy and delicious, it's hard to see how you couldn't just set aside a half hour to make a ton of these at a time. I'm in love! 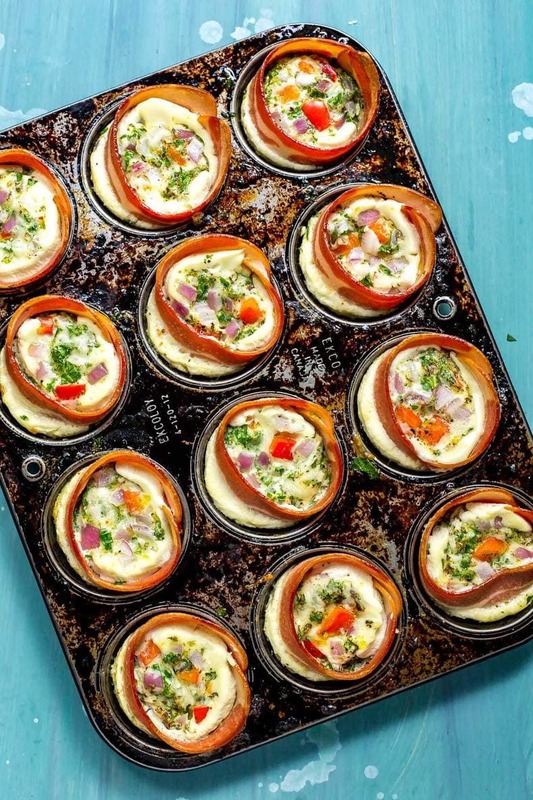 These Grab & Go Turkey Bacon Egg White Cups are a delicious grab and go breakfast idea filled with veggies - and they're ready in just 25 minutes! Preheat oven to 350 F. Grease 12 muffin cups with cooking spray, olive oil or butter. Line each cup with turkey bacon slices. Meanwhile, mix egg whites with Italian seasoning and salt. Prepare veggies. 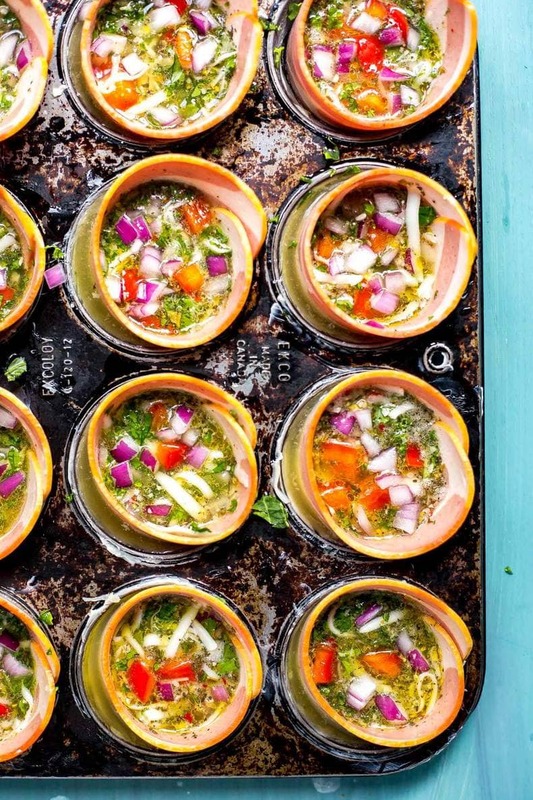 Divide veggies, cheese and egg whites among muffin cups, then bake in the oven for 15 min. Let cool then refrigerate or freeze until ready to eat. 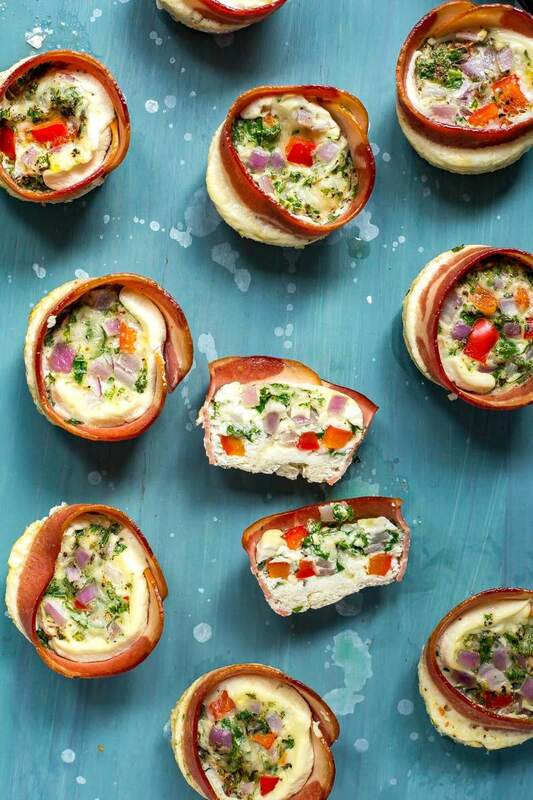 Reheat in microwave for 1 min for refrigerated egg cups, or 2-3 min for frozen. Serving size is 2 egg cups. Hey Taylor! Thanks for another great recipe! Out of curiosity – would you happen to know the calorie count for both egg whites only and using the whole egg? Thanks!